I’m just back from a magical week which started in the north-east of Scotland where I lived for 17 years and was followed by Orkney — a first for both me and my partner. And I’m still processing it all! We were truly blessed with the weather: all those years spent on the edge of the North Sea taught me to treasure each blue sky day and it was an absolute joy to return to glorious and (almost) wall-to-wall sunshine. And next to no wind. 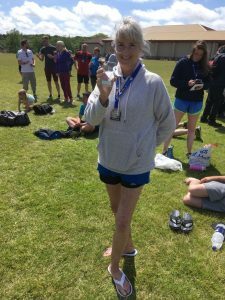 The trip was engineered around the Ythan Challenge, the adventure race in Ellon, Aberdeenshire, I co-founded in 2001, and I was back to defend my first vintage woman title. 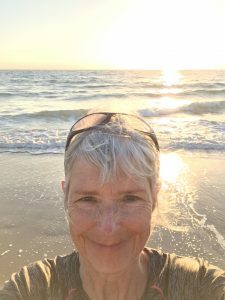 I’d not dared run for 10 days in the run-up after my left calf muscle began bleating, so went into the event not knowing whether I’d actually finish. And the thing about this race is that the course changes every year, so you never know how far you’re going to run or what you’re going to meet. 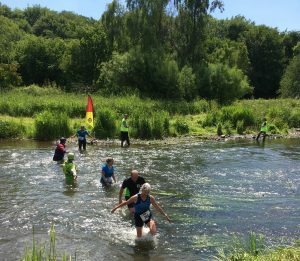 The 2018 version on 24 June was 12.5k with a fine mix of obstacles, including a crossing of the river that gives the event its name and assorted hay bales, cargo nets, scaffolds, tyres, mud, and other stuff along the way. The final obstacle was a foam-filled bouncy castle — brilliant! My calf held out until the final 1.5k or so, but I did that tried-and-tested runner’s ‘if I give it no attention it’ll go away’ thing and just cracked on. It didn’t go away, of course, but it didn’t stop me finishing either. I was chuffed to win my age group again, but actually far more chuffed just to be part of an event that was conjured up with my co-founder over a cuppa at my kitchen table nearly 18 years earlier. The Ythan Challenge was Scotland’s first adventure race and remains a not-for-profit event run entirely by a team of dedicated volunteers with all proceeds going to community youth groups. Box ticked, next stop Orkney. We’d not made any specific plans, but getting in at least one swim was a clearly a must. 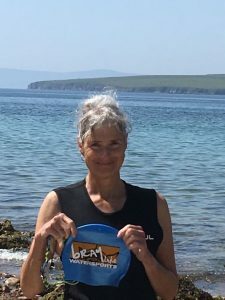 I’d been accepted into the Orkney Polar Bears wild swimmers’ Facebook group a few weeks earlier and was delighted to find a swim scheduled for the next day in Evie, a village a half-hour drive away from our AirBnB. 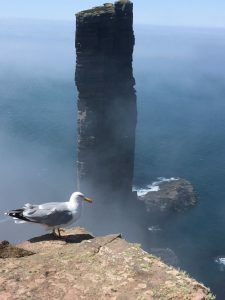 There were three of us: the host, who came to Orkney when she and her future husband were students and never left, and another visitor like me. I knew the water was going to be a lot colder than I’d got used to over the past couple of months and so I wore my neoprene vest. And it was indeed colder. A lot. When I’d had my final pre-trip swim at Bray Lake, the water temperature was hovering around 20C; this was little more than 10C, with the air 15C. But that mattered not a jot: it was simply amazing to be swimming in these clear, vibrant waters, pretty much where the Atlantic meets the North Sea. I’d never swum this far north before — another little box ticked. The following day, more Polar Bears were congregating for a lunchtime dip in Scapa, next to the pier used by the pilot boats and tugs serving the mix of maritime traffic passing through Orkney’s coastal waters. Again I wore my vest, but this time both the water and air were a lot warmer and getting in did not take my breath away. I would have happily pottered around for ages, but my three fellow swimmers had places to be and I didn’t want to go it alone in unknown territory. Another truly glorious swim, fully etched in my memory now. The highest of high moments? Following a shoal of tiny fish for maybe 50 metres before they outpaced and outmanoeuvred me, leaving nothing but water and seabed behind. Swim number 3 — a true bonus — came at the end of one of those days carved out of serendipity. We’d caught the inter-island ferry to Hoy, going as foot passengers after being told there was no guarantee we’d be able to get a spot for the car on the return leg. We’d decided to stay close to the ferry’s departure point and head back to Mainland in a couple of hours’ time, but as we ambled along a car pulled up. Did we want a lift to Rackwick, the starting point for the walk to the Old Man of Hoy? Via the sea eagles’ nest? Did we?! Absolutely! And what followed was just perfect. There were five of us: the driver — who lives and runs an environmental consultancy in Orkney — his sister, his sister’s partner and us. And we hit it off from the outset, quickly discovering several areas not just of common interest, but common experience. That six degrees of separation thing exemplified. The walk to the Old Man and back was jaw-dropping, and viewing the sea eagles’ nest from an RSPB observation post beside the road was both wonderful and humbling in equal measure. Wonderful to be in this pure, wild environment, and to witness something so special; humbling that the excitement was all one-way traffic. Those magnificent raptors give not a toss about us! So back on the last ferry to Mainland, and back to Evie for my final swim, organised at the last minute by the ever-welcoming Bears. The water was choppier this time, the mood a little edgier — especially when one of the team thought they’d seen a jellyfish and it could have been the one all swimmers fear, a lion’s mane. We started paying much closer attention to what we were doing — especially with two children in the group — and now nobody was in the mood for staying in too long. Would I have chosen a more carefree finale? Maybe, but I also appreciated this stark reminder that the sea — especially this far north — demands a much, much higher level of respect and rigour than the lakes and rivers I’m accustomed to. 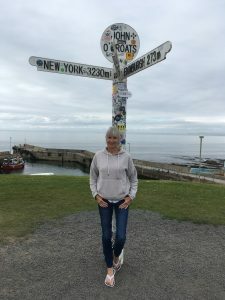 We left the next morning having barely scratched Orkney’s surface, doing just a handful of the things visitors do. So we will be back, we will definitely be back. You may meanwhile have noticed I’ve not used the SUP word once in this post. That’s because my lovely Starboard stayed at home for logistical reasons and nowhere in Orkney rents them. Yup. You can’t rent a paddleboard anywhere, on any of the islands! So interesting Eugenie, You amaze and inspire me! Love your joie de vivre & passion for life Eugenie! What an amazing adventure! Very inspiring ! Thankyou for sharing!